When Event #58: $1,500 Mixed-Max No-Limit Hold'em kicked off on Monday there were 1,475 runners in the room, each hoping to find themselves where Jared Jaffee sits tonight. The longtime pro finally earned his first World Series of Poker bracelet after recording 11 cashes here at the Rio since 2009, and with the accomplishment he also moved one step closer to capturing poker's "Triple Crown." 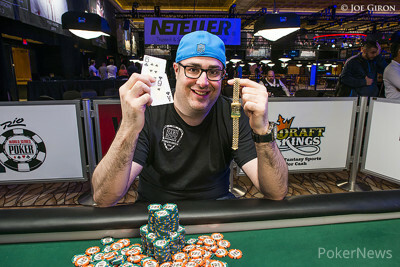 Jaffee took down the World Poker Tour Jacksonville bestbet Fall Poker Scramble $3,500 No-Limit Hold'em Main Event in November of last year, but as every poker player knows, there's nothing quite like grabbing the WSOP gold. The mixed-max format saw the field play a full first day of nine-handed action and whittle the field down to 181, and on Day 2 the tables shrunk to six-handed for another gauntlet of short-handed poker. Late on Day 2, the final 24 players reconvened at four-handed tables and the pace accelerated until just 10 remained. Jaffee topped the counts entering the third and final day of play, and he quickly went to work building on that advantage. A crucial cooler of a hand against Brandon Cantu propelled Jaffee into the final four heads-up matches with nearly half the chips in play, as Jaffee's kings were ran down by Cantu's queens, until the river reversed the situation in cruel fashion for the combustible Cantu. Armed with a massive chip advantage over his heads-up opponent Joseph Alban, Jaffee dispatched him in short order to secure a spot in the finals, where he would face fellow pro Mike Watson. Both players were searching for their first WSOP bracelet, and a lengthy heads-up duel ensued in which Watson fought back admirably from a nearly 2-1 disadvantage when play began. Watson picked off a bold bluff by Jaffee to briefly claim the chip lead, but Jaffee continued to apply pressure with preflop raises and post-flop aggression, winning the majority of pots during the contest. Eventually, the tide turned in Jaffee's favor and he finished Watson off in stunning fashion, going runner-runner to make a straight and crack Watson's pocket jacks in a preflop clash. Jaffee collected $405,428 for the first-place finish, pushing over the $2 million live earnings milestone in the process by capturing his third six-figure score in a nine-month span. He now needs only a victory on the European Poker Tour to become the latest member of the "Triple Crown" club, proving that Jaffee's name belongs among the short list of poker's rising stars. Mike Watson Eliminated in 2nd Place ($246,068); Jared Jaffee Wins! Hand #99: Mike Watson limped the button, Jared Jaffee raised to 180,000 in the big blind and Watson reraised all in for about 1.6 million. Jaffee took a deep breath and sighed before he announced a call. "ACE!!!!!!" yelled Jaffee's rail as everyone stood up in anticipation for what was to come. The flop came down , keeping Watson well in front with his pair of jacks. Short of an ace, the turn was as good as it gets for Jaffee as it gave him a flush draw and an open-ended straight draw. The river gave Jaffee an eight-high straight to lock up the victory, ending Watson's run in second place. 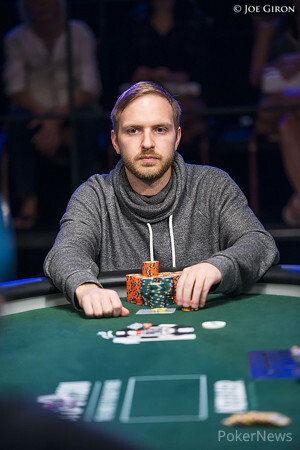 Hand #97: Mike Watson limped on the button, Jared Jaffee checked his option and the flop fell . Jaffee check-called 100,000 to see the turn where both checked. The river completed the board and both checked again. Jaffee tabled for kings and eights, besting Watson's holdings to win the pot. Hand #98: Jared Jaffee raised to 175,000 on the button and Mike Watson called three-bet shoved for about 1.45 million from the big blind. "It's close," said Jaffee, before he folded. Hand #93: Mike Watson opened to 120,000 and Jared Jaffee three-bet to 290,000. Watson studied the situation for a long moment before coolly announcing himself all in for 1.6 million. Jaffee's cards were in the muck before Watson's chips were pushed forward. Hand #94: Jaffee opened to 125,000, Watson flatted, and the flop fell . Watson checked, Jaffee fired for 165,000, and Watson smooth-called to take the on the turn. Both players checked fourth street, as they did on the river. Watson rolled over and his busted straight draw was good for the winner. Hand #95: Watson opened to 120,000 and Jaffee flatted, with the flop coming down . Jaffee then check-folded to Watson's 130,000 wager. Hand #96: Jaffee opened to 125,000, Watson three-bet to 350,000, and Jaffee made the call. After the dealer fanned the Watson checked and Jaffee did the same, bringing the to the table on the turn. Watson then fired out for 360,000 and Jaffee began toying with his chips before cutting out the calling chips and stacking them forward. The river card came and Watson peered ahead into the ether, riffling a stack of chips slowly while studying the board. Finally, he tapped the table and the action moved to Jaffee, who did the same. Jaffee took the pot down with a turned pair of aces, while Watson's straight and flush draws failed to come through on the river. 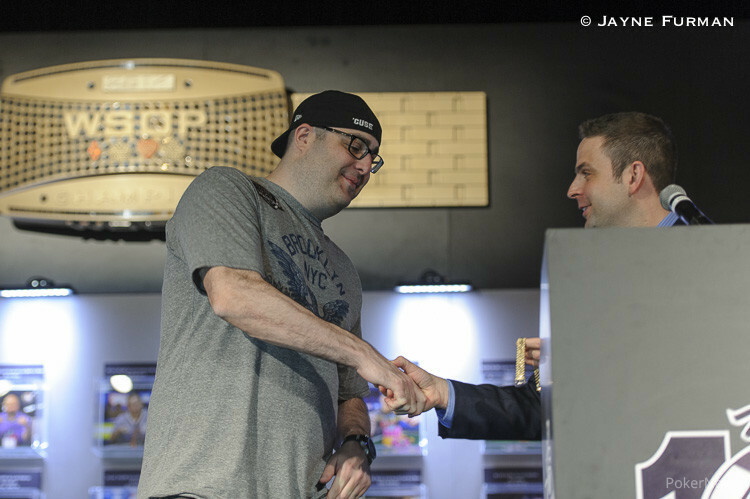 Hand #86: Jared Jaffee raised to 125,000 on the button and Mike Watson folded his big blind. Hand #87: Jaffee received a walk. Hand #88: Jaffee raised to 125,000 on the button and Watson folded. Hand #89: Watson raised to 120,000 on the button and Jaffee called. The flop fell and Jaffee check-folded to a bet of 130,000 from Watson. Hand #90: Watson received a walk. Hand #91: Watson raised to 120,000 on the button and Jaffee three-bet to 295,000 from the big blind. Watson folded. Hand #92: Jaffee raised to 125,000 on the button and Watson called. The flop fell and Watson check-folded to a bet of 160,000 from Jaffee. Hand #80: Jared Jaffee opened for 125,000 and Watson flatted to see the flop. 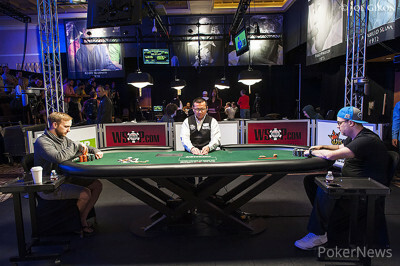 Both players checked and the turn came , prompting Watson to bet out for 150,000. Jaffee eyed the bet and sized Watson up from across the table before making the laydown. Hand #81: Watson opened for 120,000 and took down the pot without a fight. Hand #82: Jaffee opened to 125,000, Watson flatted, and the flop came down . Watson tapped the table, Jaffee fired away for 155,000 and Watson folded. Hand #83: Watson opened for 120,000, Jaffee defended his big blind, and the flop was . Both players checked, and the turn came . Jaffee then led out for 165,000 and Watson called to see the complete the board on the river. Jaffee fired away with a bet of 405,000 and Watson relented to send the sizable pot Jaffee's way. Hand #84: Jaffee opened to 125,000 and Watson laid down. Hand #85: Watson opened for 120,000, Jaffee flatted and the flop fell . Jaffee check-folded to Watson's 130,000 wager.